Horizontalization isn’t a word, but you know what it means. Lighting Science and Dixon today announced that the two will produce a 60-watt equivalent LED bulb for $15, effectively slashing the price of solid state lighting for consumers in half. 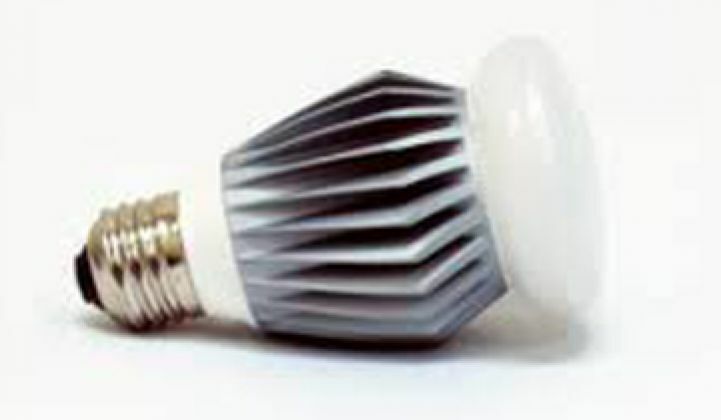 The bulb will first appear in India at the end of the year, but will go global in 2012. The bulb is similar to the $30 60-watt equivalent bulb released by Lighting Science in the U.S. earlier this year (pictured). The new bulb, however, will consume even less power -- only 8.5 watts -- and, of course, will cost less. Lowering the power consumption will also help make the bulb easier to use (or at least improve customer satisfaction) in India, where blackouts and brownouts remain daily occurrences. The lower price derives from three factors that make the lighting business look almost like the PC industry circa 1987. First, chip improvements are leading to lower prices in the same way that advances in processors and memory led to cheaper, better computers. LED manufacturers are increasing the output of lumens per watt in their light-emitting diodes, the little chips inside the bulbs that produce light. In turn, that lets LED bulb makers insert fewer chips into their final products to produce the same amount of light. The chips themselves account for around 60 percent of the cost of a bulb, and a 60-watt equivalent LED typically contains around 18 LEDs. Cutting that down to 15 or even 10 LEDs will thus have an impact on the retail price of the bulb. Haitz's Law, the Moore's Law of LED, predicts how performance will improve and costs will decline over time. Second, new types of heat sinks will also help lower the price, in the same way that the hard drive industry helped cut computer prices. Although the light from LED chips is not hot, the chip itself gets hot. Right now, most home LED bulbs use hefty aluminum heat sinks to dissipate that heat. Some of the newer bulbs, however, come with heat sinks that require far less aluminum: better air channeling helps reduce the bulk. Startup Ventiva, by contrast, has developed an ionizer. A mesh of wires near the LED chip creates an electric field with a small electric charge. The ions create a breeze, which in turn eliminates heat. Similarly, Nuventix has created a tiny device that creates a vortex of wind near the chip to dissipate heat. A third factor in lowering prices is arguably an emerging trend toward horizontalization (sic) in solid state lighting. While the major LED and lighting companies such as Philips, Osram and Cree are coming out with their own bulbs and fixtures, they also sell components to less-heralded companies like Lighting Science, MSI and LEDnovation, who then incorporate design and technology nuances of their own to stand out in the market. Look at this announcement: Lighting Science designs the bulbs, harvests components from others, and Dixon assembles it. Lighting Science is also developing a bulb with Google that can be controlled through an Android phone. The underlying network protocol is 6LowPAN. Vizio, the largest TV maker in the U.S., told us back in June that it will soon come out with LED bulbs. Vizio has strong ties to Costco and relies heavily on contract manufacturers. There is no guarantee that solid state lighting will become horizontal. PCs and cell phones get replaced every four years or less. That relatively rapid turnover rate allows multinational manufacturers to act as background suppliers of components and technology and still make a profit. LED lifetimes stretch into decades. Some believe that the best way to survive will be to become an vertically integrated manufacturer that produces the chips, the bulbs and even the fixtures. But some, such as Mayfield partner Navin Chaddha, which invested in LED component maker ShineOn, think horizontal will be the way to go. And here is the bonus fourth factor: creativity in the sales and distribution channel. An LED bulb can cut your power bills by around $10 a year. Alan Salzman of VantagePoint Venture partners told us in 2010 that when LED bulbs hit the $20 price point, you could start to see utilities give them away to consumers for free as a way to curb power consumption. (VantagePoint has investments in a few LED companies, but not Lighting Science.) Bill Watkins, CEO of LED manufacturer Bridgelux, has noted that CFL shipments began to take off after they crossed the $20 barrier. The availability of $15 bulbs from a variety of manufacturers could prove to become a tipping point. Consumers will still blanch at the price tag, but if utilities start giving them away for free, and the benefits can be documented, sales could grow on their own. In Thailand and other emerging nations, some cities are moving toward LED streetlights to relieve stress on the grid and cut municipal power bills. The quality of modern LED bulbs is pretty good, by the way. We've been testing the $30 60-watt equivalent LED bulb for a while. It's actually brighter than most 60-watt incandescents. Here's a video of Lighting Science's 40-watt equivalent -- perhaps the best bulb we tested last year. A video of the new bulb should be on the site soon.